By now we hopefully understand that the Pythagorean temperament is really a stack of pure perfect 5ths (Pythagorean 5ths) and can bring out melodic beauty, and the temperament based on the narrow 5ths, each tampered by a quarter of a syntonic comma (mean-tone 5ths), can bring out chordal beauty. Then what about those so-called well-temperaments like Kirnberger, Werckmeister, Vallotti and Young? What is the 1/6-comma mean-tone that we hear about lately? How different is that from the Vallotti or the Young temperaments? The schisma is soo tiny, Kirnberger just hid it between F#—C# in the cycle of 5ths. Technically, therefore, the Kirnberger III temperament has four mean-tone 5ths, seven pure 5ths and one almost pure 5th. I understand a lot of keyboardists like this temperament as it has the same CGDAE as mean-tone (and no wolf, mind you!). Well, those well-temperaments, having a lot of pure 5ths and some harmony-friendly major 3rds at the same time, don’t really stay at one place in the melodic—harmonic character spectrum. In simpler keys, it belongs to the harmonic side of the spectrum, but as you move to the keys with more sharps or flats, it becomes more melodic in character —— I think this is important. I don’t think it’s just me who had this notion that the more sharps or flats you have in the key signature the worse the keyboard sounds harmonically… But if you understand this character-shift from harmonic to melodic, the way those preludes and fugues in the Well-Tempered Clavier were written do makes sense. And remember, even when the temperament is on the melodic side of the spectrum like F# major, many 5ths are now pure; depending on how you present the triads, you still can play beautiful chords. I think the Eb/D# minor prelude and fugue from the WTC book 1 (BWV 853) sounds totally and utterly beautiful in the Werckmeister 1(III)..!! Now, finally, we get to the 1/6-comma mean-tone. You can get this temperament by having eleven 5ths that are each narrowed by a sixth of a syntonic comma and one wide 5th in the cycle. Yes, just like the 1/4-comma mean-tone, you still get the wolf, but it isn’t as bad as the wolf in the 1/4-comma mean-tone. According to my quick calculation, the wolf intervals in the 1/4-comma and 1/6-comma mean-tone temperaments are 737.64 cents and 717.92 cents respectively. I understand that the 1/6-comma mean-tone, just like the simple keys in the 1/6-Pythagorean-comma systems, doesn’t have any relevant intervals pure, but 5ths are narrow enough to make some major 3rds workable for decent harmonies. There are some good things about this 1/6-comma mean-tone —— but I think they’re relatively minor except the one thing I’m going to mention a few lines down, and I’m just going to let those advocates like Dr. Ross W. Duffin do the sales pitch. Now, what about tonal characteristics..? It’s not there in this temperament, as Dr. Duffin himself points out. It is still a ‘mean’ tone system; unlike the Pythagorean systems, here diatonic semitones are all the same, and chromatic semitones are all the same. That’s great for fretted instruments, but this is just a ‘somewhat’ harmonic temperament without much character. The 1/6-Pythagorean-comma systems, on the other hand, still can shift from harmonic to melodic, though its spectrum is narrower on the harmonic side than the 1/4-comma systems. Practically speaking, from a string player’s standpoint, I’d prefer a 1/6-comma system, because the open string 5ths in a 1/4-comma system are too narrow and a bit uncomfortable to tune, especially in an ensemble situation (good luck if you are playing the violin-family instrument with a mean-tone keyboard!). But within some different 1/6-comma systems, as long as the width of the open string 5ths are the same (C–G, G–D, D–A, A–E), I don’t think we should be too picky about which temperament to choose, to be honest. If you’re a baroque violinist, I know you have those experiences where you had to tune your instrument quickly without the aid of a keyboard instrument in performance situations. There’s no way you could tune the narrow 5ths quickly, quietly and accurately without a keyboard instrument, but you adjust pitches anyway, and you get by. This is to give you a perspective: around the pitch A we use for tuning, a 4-cent difference between two As in unison would give you about one acoustic beat a second. The same 4-cent difference between two As at an octave below will cause about a beat per 2 seconds. The higher the frequencies are, the more beats you hear (we treble instrument players do get to realize this every time we play, don’t we?). In simpler keys, the differences between Vallotti and the 1/6-comma mean-tone are usually within a couple cents, and when you play with a cold left hand, your inaccuracy can easily surpass those differences (maybe only mine :-D). 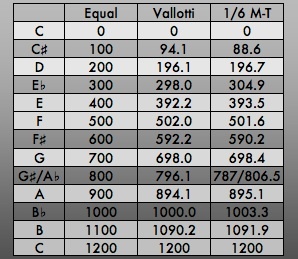 If I’m to choose a system for my ensemble, I’d give a little edge to Vallotti; in the Vallotti temperament, you can reach the most melodic side of the spectrum in F-sharp major and E-flat minor with pure 5ths; in those key areas the sharp mediants and leading tones can give Vallotti some tension and nice melodic contours that 1/6-comma mean-tone cannot provide. There are many people who don’t appreciate 1/6-Pythagorean-comma systems out there. Some say they are too new to use for Bach, and others say this temperament is too much like the equal temperament — nothing is particularly beautiful. Although Vallotti claims to have worked out his system by 1728, the first time it was cited elsewhere (that we know of) was in 1781 in England. Well, not all historical temperament systems were documented, and it is not inconceivable at all that some other folks from Bach’s area and generation had come up with a Vallotti-like system… And I believe that the authenticity and legitimacy of specific temperament theories aren’t really relevant to actual tuning system in current performing arena. Also, if a 1/6-Pythagorean-comma system is too moderate and not harmony-friendly enough, no other 1/6-comma system really is, including the 1/6-comma mean-tone. Granted that a 1/6-Pythagorean-comma system cannot give you pure 3rds, it can give you pure 5ths with their Pythagorean melodic quality in a certain key area. The 1/6-comma mean-tone cannot give you anything pure that’s relevant, mind you. Why do they dislike the 1/6-Pythagorean-comma systems so much, really? I think that 1/6-Pythagorean-comma systems are the most well-compromised temperaments we have today that still incorporate the character-shift that I find important. A lot of the things you state happens to be astonishingly precise and that makes me ponder why I hadn’t looked at this in this light previously. Your piece really did turn the light on for me personally as far as this particular topic goes. But at this time there is 1 point I am not necessarily too cozy with and whilst I make an effort to reconcile that with the main theme of the point, let me see what the rest of the subscribers have to say.Nicely done. Next Post Spring has come— fishing season is here!